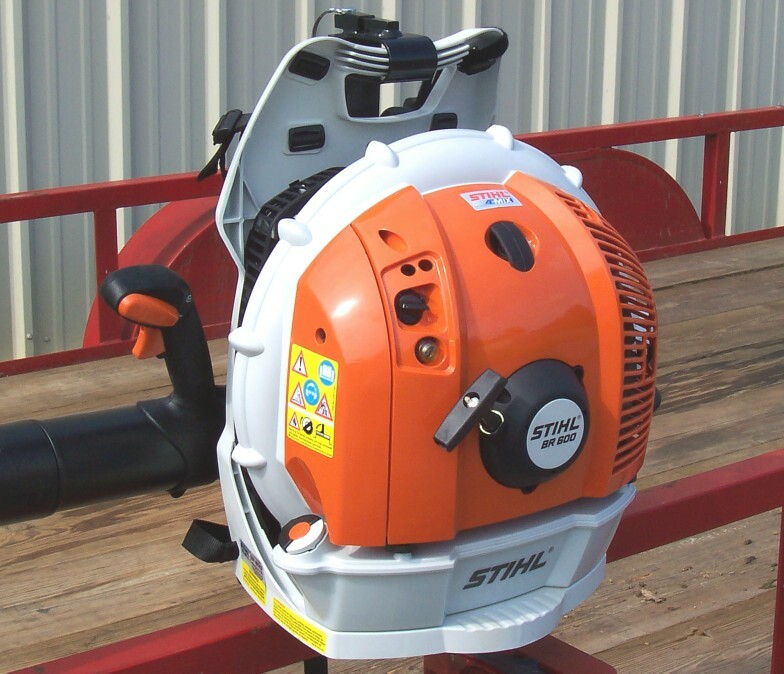 This blower rack is specifically made to allow you to put your back pack blower on the front of your zero turn to cut big blowing jobs down to size and save you time and labor! 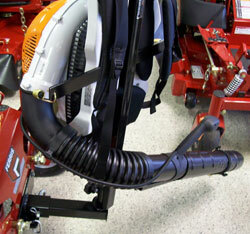 It can accommodate any backpack blower. 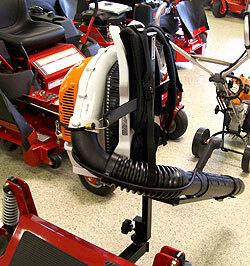 The blower simply sits on the rack and is held in place with a bungee cord for quick and easy mounting and dismounting. 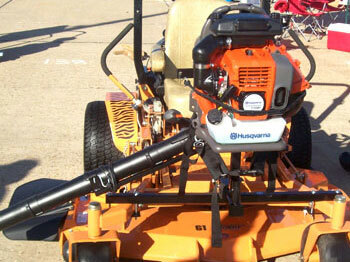 Once the blower is mounted on the rack the blower can be turned 360 degrees so you can point the blower any direction you want. Once the desired direction is found a simple quick turn of a knob locks it into place. After the direction of blowing is obtained you can also select the desired tube position as well, you can set the tube of your blower as close to the ground as you want and again, just simply set that position with the quick turn of a knob and your ready to work. 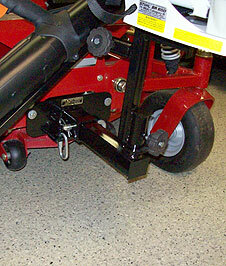 The Blow-N-Go Zero Turn Blower Rack mounts to the front of your zero turn mower with the included 2" receiver hitch. 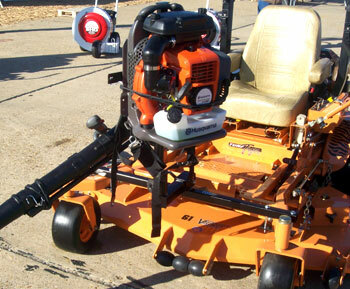 The way this works is the 2'' receiver hitch is bolted to the front of your mower and then the blower rack can be mounted and dismounted quickly and easily when your ready to use it. 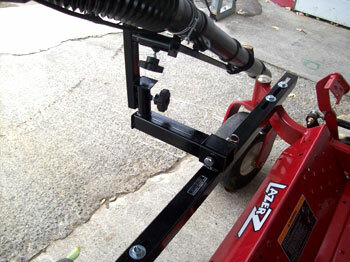 The blower rack mounts in the hitch just the same as any standard 2" receiver with the included 5/8" pin. The 2'' hitch also has some other benefits, it requires no modifications to your machine at all, it mounts to the existing holes on your machine or comes with the needed mounting brackets for your specific machine. Other benefits of the hitch allows you to accept other front mount zero turn attachments such a leaf plows, carrying trays, sprayers, etc. 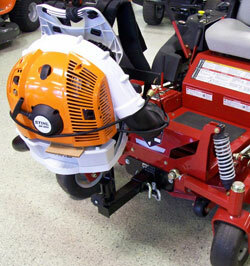 The Blow-N-Go front mount blower rack is currently available for Scag Turf Tiger, Bad Boy, Snapper, Ferris, Hustler, and Grasshopper 200 and 300 series. 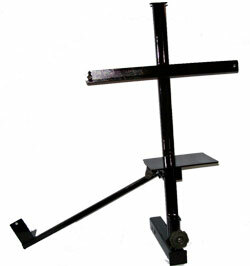 Please let us know your make and model when ordering to insure you get the correct receiver hitch. As always questions are welcome. U.S. Patent pending. 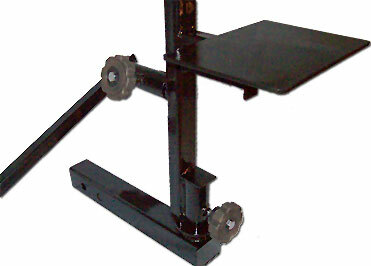 Dealer and Wholesaler pricing available. Inquires welcome. VISA and Mastercard are accepted by phone or you can order using our paypal shopping cart. 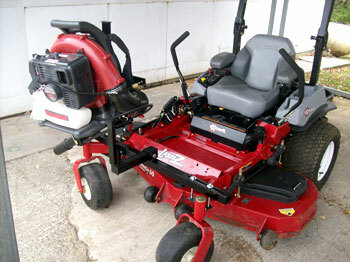 We can combine shipping on multiple item orders if possible. Please call 423-462-5815 for an adjusted shipping rate if you order more than one item.